By all accounts, Red Robin is very successful restaurant chain. With hundreds of locations nation-wide and well-deserved plaudits for their Unbridled Acts customer service program, Red Robin has it together. (try the Bonzai Burger, Bruschetta Chicken Burger, and the Tower of Onion Rings). 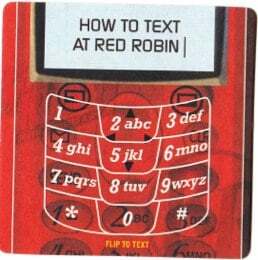 But the Red Robin customer loyalty messaging program is far less than it should be. In fact, it’s downright weird. Umm, what? 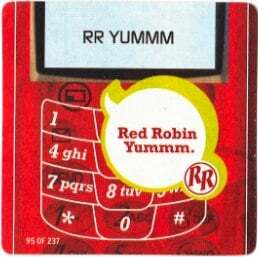 “Red Robin Yummm”? I literally stared at the coaster for a couple minutes before I realized that this was NOT a national SMS program, but rather some sort of conversation piece. I still don’t fully understand it. What I completely can’t fathom is that they spent a ton of money on creating fake text messaging coasters. If you’re going to those lengths, why not just put in 1.5% more effort and create an ACTUAL program? It turns out, you get a free gift for supplying your email address, and a FREE BURGER on your birthday. I helped set up Cold Stone Creamery’s massively successful birthday club email program (which now has millions of members). A free anything on your birthday is a big deal. 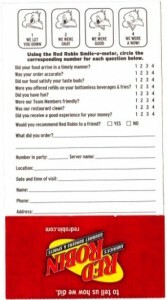 Why would Red Robin create a card that leads with the circle a bird head scale, and hides a very compelling call to action under a fold over that many people will NEVER see? Ridiculous. If you want to build a list, ask people to sign up. In this case it’s as if Red Robin feels they have to launch a birthday club, but are sort of embarrassed about it, so they hide it. Like people that keep their ill-behaved, slobbery dogs in a guest bedroom when they have company over to watch football. Red Robin has all the ingredients for a wildly successful, multi-modal messaging program. Brand loyalty. Budget. At least some executive support for a birthday club. But for a restaurant that bills themselves as “Master Mixologists” the combination of elements in this program could use some serious re-working.